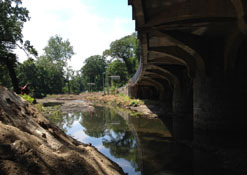 Replacement of Crane Road Bridge on the Bronx River Parkway started June 4, 2012. 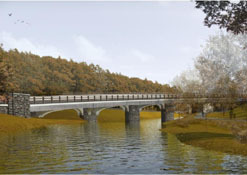 The project is expected to be completed in 2015 and involves replacing the bridge over the Bronx River as well as the bridge over the MTA Metro-North Railroad. During construction the existing bridge will remain in operation. The new bridge will have wider lanes and shoulders and will included a northbound deceleration lane to Exit 12 - Crane Road. Also included will be a sidewalk/ramp accessing the Bronx River Pathway and the southbound Scarsdale Railroad Station Platform. Read more about the undertaking of this project. The reconstruction of this bridge is the largest construction project ever undertaken by the county on the Bronx River Parkway. While local residents and those who use this section of the Bronx River Parkway have witnessed the progress of this project, we have assembled a photo gallery that visually chronicles the progress made to date.